Consultant will produce a scoping paper on digital literacy and skills based on a broad scoping review and analysis. Around half the world will be online in 2018, including 70% of 15-24-year old (ITU, 2017). While this is a major achievement, online access is only one aspect of the bigger picture of digital inclusion. Equally important is ensuring that access is affordable, that users have the capabilities to make the most of digital opportunities, and that they are encouraged to go online. Even for those with access, if they are not equipped or motivated to make the best use of the Internet, then the impact of access is very limited. UNICEF believes that digital literacy and skills – the user capabilities – are essential for children to have meaningful access to the Internet, allowing them to be both safe and successful online and to be able to fully exercise their rights, such as the right to privacy, freedom of expression, information and education (UNICEF, 2018). A holistic approach to digital literacy and skills encompasses equipping children with the technical, cognitive and social skills needed to be protected and productive in a digital age. Just as important is including parents/caregivers and educators in the learning process, and grounding digital literacy and skills within a broader skills framework for life and work, such as the Global Skills Framework currently being developed by UNICEF. While there is global recognition of the importance for children to be active digital citizens (for example, Council of Europe, 2018), many barriers remain to make this a reality. Included are a lack of access to connectivity and a lack of digital infrastructure, affordability, limited content that is relevant and in local languages, restrictive social norms and lack of the necessary digital literacy and skills (UNICEF, 2017). In addition to limiting the use of digital technologies by children, these barriers – among others – also limit the ability of governments and community organizations to provide digital literacy and skills programs. Not having appropriate curricula that keep up with the fast-changing digital landscape, a lack of qualified trainers, and the slow response of the formal education sector to include digital skills into teaching practice are further barriers (ITU, 2018). In some cases, well-intentioned efforts to increase digital literacy are hampered by the lack of data on children’s digital behavior that would better inform programs and policies. While the private sector is a key stakeholder in offering digital literacy training, sometimes the focus may be more on promoting particular software platforms than on equity and children’s rights. Overall, where provision does occur, its quality and effectiveness remain inconsistent (Broadband Commission for Sustainable Development, ITU and UNESCO, 2017). As a result, already marginalized groups may be further disadvantaged by digital progress, especially including girls, children who are out of school and children with disabilities. To date, digital literacy and skills have not been strong policy and program areas for UNICEF. There is not an agreed definition of these areas in the Organization and no commonly-held digital literacy framework to guide programs. From an education perspective, a focus on developing the basics of literacy and numeracy, as well as increasing education equity and quality, is critical and must continue. However, today these dimensions need to be reconsidered in an increasingly digital world. Children unprepared for life in the 21st century will be excluded from a range of digital activities: they will not have access to educational and social resources; not be able to utilize community and government services that are progressively offered only online; not be able to play online, develop online identities and participate in digital civic engagement; and not be prepared to succeed in the digital economy. A holistic approach to digital inclusion is needed that ensures affordable access, online safety and digital literacy and skills. A wide range of stakeholders – governments, NGOs, the private sector, academia and those in the school, community and family units – are required in the digital ecosystem, which must be enabled by supportive policies. Complex barriers that limit the rights and opportunities of children in a digital age must be addressed, not only for today but also for the future as digital literacy becomes increasingly essential for the workplace. There is thus a need to keep making the case for digital literacy and skills in the 21st century – alongside the other foundational skills of literacy and numeracy – and, more urgently, to mainstream the provision of digital inclusion, literacy and skills into UNICEF’s work (while always taking into account the vastly different contexts in which we work). Policy support is needed for country offices, governments, civil society and the private sector. In this regard, the Policy Lab is well placed to provide the necessary thought leadership and policy guidance to help realize the potential of children in a digital world. The Policy Lab, within the Policy Section in the Division of Data, Research and Policy (DRP), UNICEF, seeks support to undertake an initial scoping exercise on digital literacy and skills. DRP serves as a catalyst to connect and amplify the data and research functions within the division and to analyze new and emerging issues, scope policy options and develop recommendations. With the Policy Section, the Policy Lab Unit was established to develop policy recommendations on new, complex or cross-cutting issues affecting children in order to inform UNICEF’s engagement and positioning, review the viability of policy solutions and provide policy guidance to UNICEF’s Country Offices and National Committees on how to integrate issues of growing importance into concrete actions. In order for UNICEF to create more enabling policies and effectively implement digital literacy programs, it is necessary to take stock of the current developments in this field - in general and within UNICEF - and to begin to map a plan for the Organization taking into account UNICEF’s mandate, field presence and its comparative advantage. Therefore, under the supervision of, and in collaboration with, the Policy Specialist, Digital Connectivity, Policy Lab, the Consultant will produce a scoping paper on digital literacy and skills based on a broad scoping review and analysis. Overall, the paper should propose a working definition of digital literacy and skills, highlight key frameworks and how they can be adapted to UNICEF’s needs, present national policy and program approaches, highlight the efforts and needs of country offices and include policy and program recommendations for UNICEF. In doing this it will contribute to the identification of gaps and priorities for future research as this field advances. 1) What are the known main barriers to increasing digital literacy and skills among children? 2) What can be learned from internationally agreed or evidence-based frameworks, national policies and large-scale programming approaches that show success or promise in in overcoming these barriers? What are most widely used and accepted definitions of digital literacy and skills (e.g. SoWC p. 128)? What are the main digital literacy learning theories and frameworks, including competency frameworks and spectrums of proficiency? What is the relationship between online and offline skills and literacies (competencies), e.g. developing 21st century skills through a digital and non-digital lens? What is our understanding of the interplay between offline and online literacies and what implications does it have for policies? What does this mean for how UNICEF understands literacy? What global, regional and national barriers are known to limit the digital literacy and skill levels of children? While there are a myriad worthwhile initiatives promoting digital literacy and skills, UNICEF is interested in large-scale programs that have been implemented and evaluated, or emerging programs that show promise, and that have been integrated into country policies. This section will describe and analyze the fore mentioned policies and programs, including: their approaches to implementation (stakeholder engagement, frameworks used; curricula developed; assessment and measurement of literacy and skills, etc. ), lessons learned, and overall trends. The exact criteria for selecting and describing the policies and programs will be decided jointly by UNICEF and the Consultant. A key context for this section is selecting initiatives and analyzing them for the purpose of improving UNICEF’s work. The paper should map the various efforts by UNICEF around the world with regards to digital literacy and skills policy and programs. Based on interviews with UNICEF country offices, what are the key needs with regard to policy support? Identify main gaps in current digital frameworks, policies and programs and identify potential roles for UNICEF. Based on the findings above, the paper should propose: a working definition of digital literacy and skills for the Organization; propose the most relevant digital literacy frameworks for the Organization to adopt; offer key recommendations for enabling policy and program implementation. The paper should also highlight any potential role UNICEF to play in improving digital literacy and skills, e.g. should UNICEF create pointers to key approaches and resources for stakeholders to help them develop curricula, teacher training, etc.? Finally, it is useful to understand the broader context of the Terms of Reference and the further work that UNICEF will undertake beyond the scoping exercise. In this regard, the scoping paper will inform a second stage of work in which the Policy Lab will develop policy guidelines to drive the digital literacy agenda in a targeted way. We aim to develop a digital literacy framework that can be contextualized to respond to country level realities and classify literacy. Later, the Lab would also like to develop guidance for UNICEF on how to use this framework to a) influence policy makers, and b) implement in a programmatic way. Providing technical support from a policy perspective will be important for the Lab. Our ultimate goal is to enable UNICEF to better deliver on its priority to “teach digital literacy to keep children informed, engaged and safe online” (UNICEF, 2017). 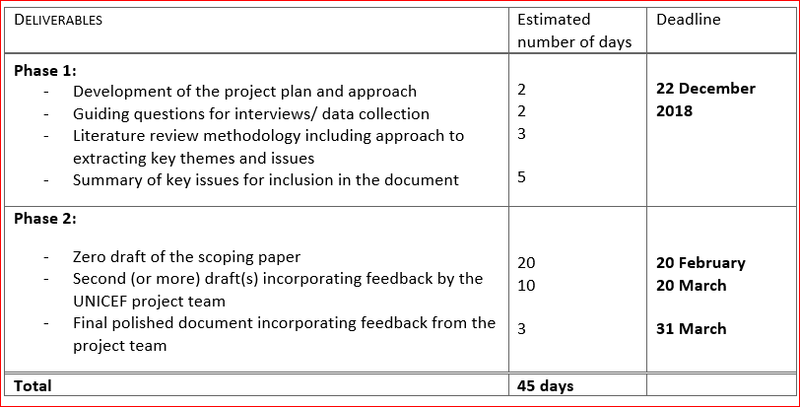 The Consultant should produce a scoping paper of approximately 10,000 words (excluding annexes), a mapping document of UNICEF’s interventions and a repository of policies/programs. Review of literature, including prior reviews and overview reports; academic studies; selective waves of searches in Google Scholar (to allow for more comprehensive full-text search) to access additional reports and articles from a broader disciplinary background; and grey literature to capture work not yet analyzed in formal/academic literature. Develop criteria for assessment of public policies, evidence-based programs and those that may not be evaluated yet, but show relevance and promise. Take stock and develop repository of policies and evidence based programs. The Consultant will also conduct interviews with key UNICEF and external stakeholders. UNICEF divisions/sections to engage include: Communication (including Youth Engagement), Child Protection, Education, Public Partnerships, Private Fundraising, T4D specialists. Country offices may include Bangkok, Kenya, Montenegro, Lebanon, Argentina and others. A number of external stakeholders will be identified jointly with UNICEF Policy Specialist. It is envisaged that around 20 interviews will need to be conducted. The scoping exercise will be done by an external consultant and include broad consultation, following which UNICEF shall organize a roundtable/event to reach a consensus on priorities and future direction. The scoping study will be reviewed both externally and internally by a small group of experts. In terms of reach, the issue of low digital literacy and skills is not constrained to developing countries alone. The European Commission, for example, notes that in Europe an estimated 20 per cent of adults lack the literacy skills they need to function fully in a modern society. For this reason, while focusing more on developing regions, the work reviewed should span both developing and developed countries (low-, middle- and high-income) and include, where possible, examples from all five major regions. Please note that following discussions with UNICEF, the structure of the paper described above may be adjusted in order to accommodate emerging/unplanned insights during the search and analysis process. The project will be undertaken in two stages: a preparatory / research stage, and a writing/ production stage. The final product should be well-reasoned, interesting and accessible to specialist readers as well as non-specialists. The report should follow the UNICEF style guide (to be provided). As an overarching principle, the Consultant is expected to share work with UNICEF on a regular basis, submitting drafts for comment and direction. Up to three rounds of drafts and feedback should be allowed for. By the completion of the second or third draft of the paper, it should be ready to be handed off to professional copy editors. DUTY STATION: NYHQ. The work may be undertaken remotely, although there are advantages to the consultant being available in New York. All work equipment (laptop, phone etc.) must be provided by the consultant. Undergraduate or Master degree in international development, communication, information and communication technology, public administration, education, or other related areas. Experience doing similar work from candidates with a different academic qualification might qualify. Years of experience: Minimum 8 years of professional experience in areas such as digital policy analysis, management consulting, ICTs & Education. Information and communication technology: Demonstrated experience or knowledge in the field of information and communication technology in education or other related fields required. Language: Superior written and oral communications skills in English are essential. Ability to work in another UN language desirable. Interpersonal skills: Motivated self-starter, with demonstrated ability to work effectively and sensitively in teams and across cultures. Experience working with public sector officials in developing countries is an asset. UN System: Good understanding of UNICEF and/or UN system, and of world affairs, current events, international development issues, trends in ICTs and education.